Don't forget to tune in for the Fox News Special airing 10PM ET on November 28th! Missed it ? Also airing Saturday November 29th 1am & 4pm, Sunday November 30th 1am and Monday December 31st 3am. 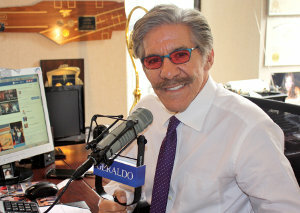 Geraldo has been visiting of Elvis' old haunts, preparing for his Fox News Special airing on November 28th. Nashville, Memphis, Los Angeles and Ocean City are just a few of the places in this hour-long special report. We all know Elvis...and over the years, Geraldo has had some great insights on his character, culture and place in the American sphere. Here, two years onwards, Rivera does an extensive investigation into the circumstances surrounding Elvis' death. He speaks with medical experts, law enforcement agents, and whoever can help him get to the bottom of the story. Unfortunately, despite the medical examiner's report of 'cardiac arrhythmia', or a heart attack, the clues seem to paint a different picture. This show, originally airing February 14, 1992, was titled "Kings Deep Dark Secret" and looked into then-popular claims regarding Elvis' relationship with his mother. Presley's step-mother, Dee Presley, is a guest on the show as well as Mike Walker from The National Enquirer, Joe Esposito, Elvis' right-hand man, J.D. Sumner his closest friend, and others who studied the king. The show includes a clip of Vernon Presley, Elvis' father. On July 24, 1992 "Servants to the Stars" aired, featuring groundbreaking interviews with the assistants and people surrounding Michael Jackson, Elvis Presley, and several other prominent names of the day. Of particular note was the interview with Mary Jenkins, Elvis' personal cook, who spoke with him on the day of his death. She was the famous maker of the "Peanut Butter Banana" sandwiches as well as the majority of his other meals. Rivera continued the Elvis trend six months later with this show "Elvismania", airing August 14, 1992. The show focused on The King's continued popularity, fifteen years after his death. Appearing are a number of Elvis impersonators strutting their stuff, from youngsters on up. Geraldo appears in an Elvis costume to great applause.